» Portfolio » Mudéjar dual Carriageway (A-23) section: Nueno – Congosto de Isuela, Huesca. Spain. 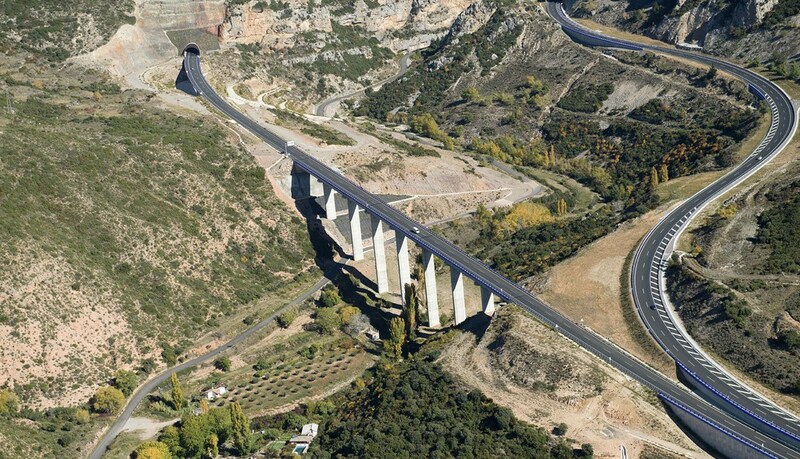 The works consisted in the execution of a section of the Mudéjar Dual Carriageway (A-23) between Nueno and the Congosto de Isuela, province of Huesca, Spain, with a length of 5,046.82 m, comprising two roads with 2 3.5 m wide lanes each, a 2.50 m external side, a 1.00 m internal side, a 1.00 m external shoulder and a variable-wide center line. This highway section also included a link in Arascués, 10 structures and a tunnel in Nueno. The whole section ramps from its beginning, so that the ascendent direction is conventionally called “ascending” and “descending” the other one. It runs in a South-North direction towards Sabiñánigo and Jaco, taking advantage of the corridor created by the N-330 road where possible. 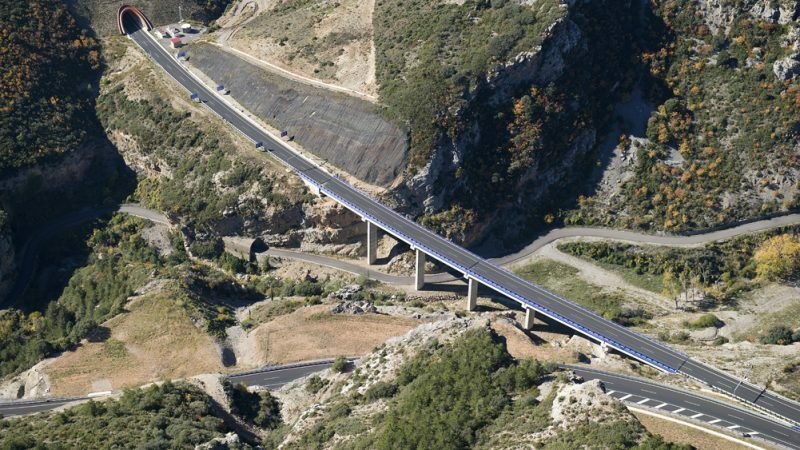 For the execution of the layout in this section, the descending carriageway (Jaca – Huesca) has been widened, creating a new infrastructure, while in the ascending carriageway (Huesca – Jaca) the existent corridor has been used, adapting it to the established parameters, that is, a minimum radio of 250 and a velocity of 80 km/h. The tunnel of Nueno is 472.00 m long, 12.00 m wide; the minimum gauge is 5.50 m. It has been executed by means of the called “New Austrian Method” in two phases (pre-tunelling and bench), using 5 supporting sections for each of the drilled materials. It has been covered with concrete of 30 cm thick and has been waterproofed with a sheet of PVC of 2 mm thick and geotextil mesh with minimum weight 500 gr/m2. 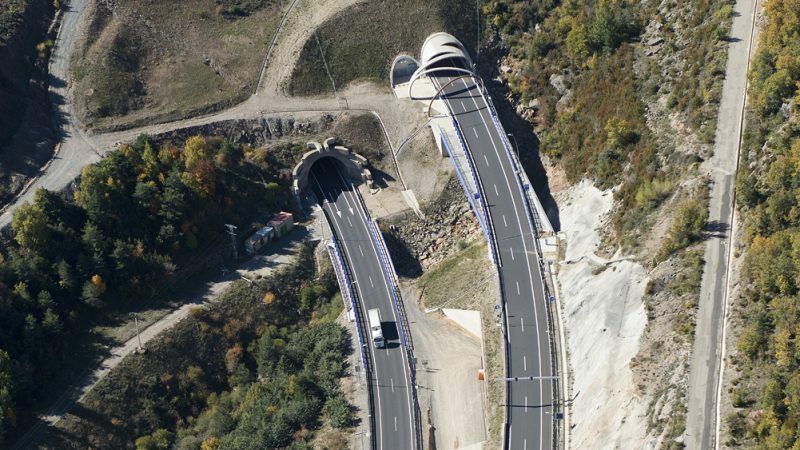 In the descending carriageway Jaca-Huesca, a false tunnel of 22.00 m long, 12.00 m wide and with a gauge of 5.10 m has been executed. The outlets and mouths of the tunnel have also been executed, as well as the lighting, ventilation, detection and fire extinguishing, control cameras and telemonitoring.